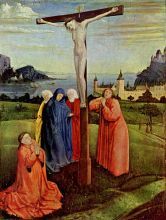 Konrad Witz (c. 1400-1410 probably in Rottweil (Württemberg/Germany) - c. Winter 1445/Spring 1446 in Basel/Switzerland) was a German painter, active mainly in Basel, Switzerland. 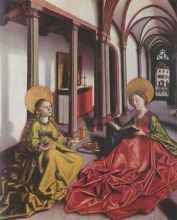 Witz is most famous for painting three altarpieces, all of which survive only partially. 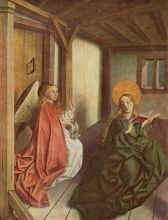 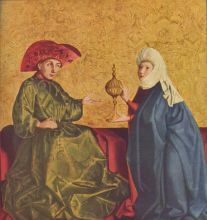 The earliest is the Heilspiegel Altarpiece of about 1435 (today mostly in the Kunstmuseum, Basel, with isolated panels in other collections). 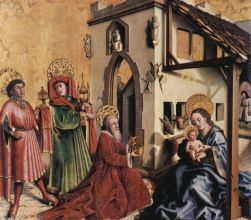 The next is the Altarpiece of the Virgin (c. 1440), which has been associated with panels now in Basel, Nuremberg, and Strasbourg. 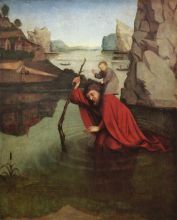 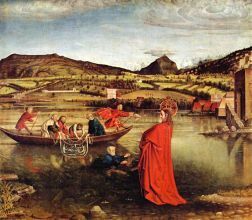 Witz's final altarpiece is the St. Peter Altarpiece of 1444 (Musée de l'Art et l'Histoire, Geneva), which contains his most famous composition, the Miraculous Draught of Fishes. 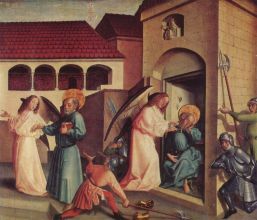 The painting of St. Christopher (Kunstmuseum, Basel; illustrated) does not seem to be related to these major altarpieces. 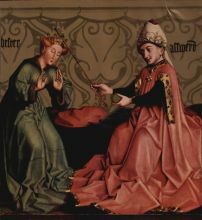 Other independent works by Witz and his followers can be found in Naples, Berlin, and New York (Frick Collection).